Welcome to the October Newsletter. There are lots of quick tips to get you thinking about the food you eat and grow, to help your health and wellbeing. In this video lesson, I show you some of the varieties of microgreens you can grow in as little as 7-21 days. These tiny pops of flavour are as tasty and nutritious as they are beautiful on the plate. I hope you enjoy the tips. To start growing your own micros, follow my Easy Guide to Growing Microgreens. Want more video lessons? 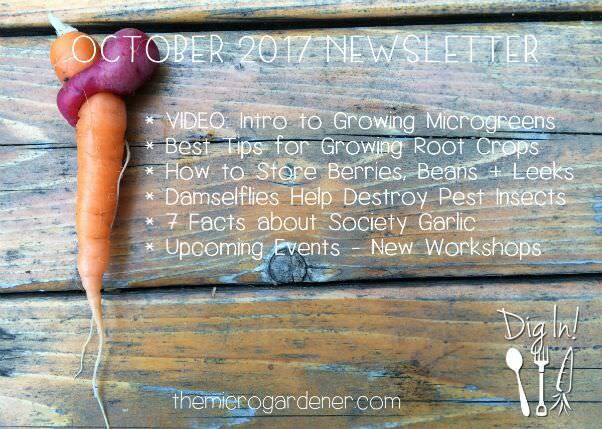 SUBSCRIBE TO MY CHANNEL and join The Micro Gardener community on YouTube. You’ll get all my latest video lessons as they are posted and catch up on ones you’ve missed. 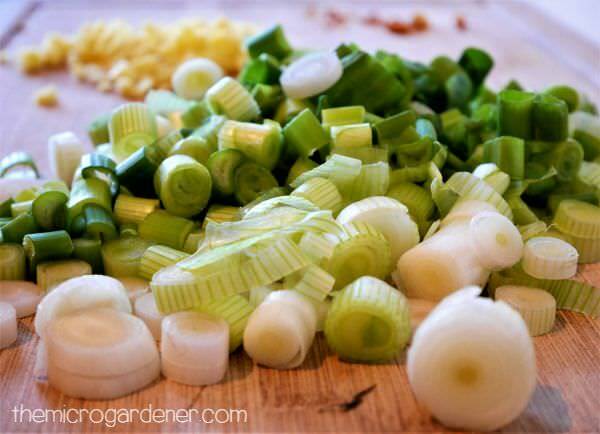 Root vegetables and spices are some of the most nutritious and tasty foods you can grow and eat. If you have never grown them before, or have struggled with success, I hope you find these tips really helpful. 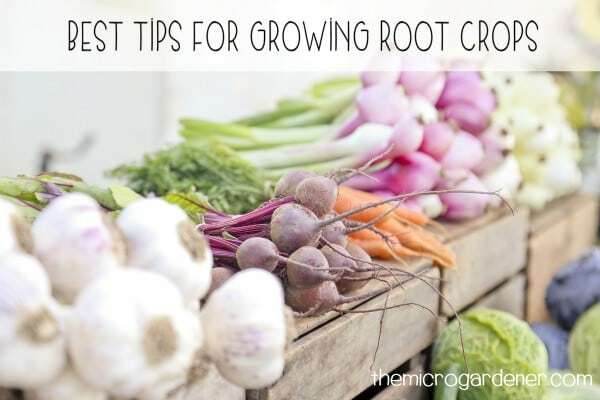 5 tips on picking and storing your root crops so they last longer. Pick your berries when sun-ripened for the best flavour and maximum nutrients. Fresh berries don’t last long so enjoy them within a day or two. 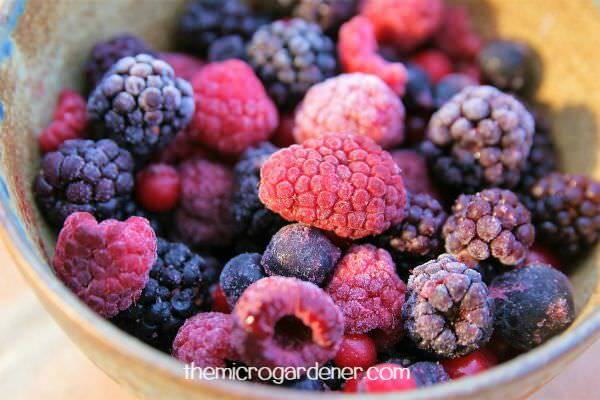 If you want to preserve your berries, you can cook or snap freeze them. Wash, dry and remove stalks as necessary. Seal in an airtight container and freeze. Cook gently and freeze the cooled berry compote, or blend and freeze the puree. Use in desserts, smoothies, salads or baking. Pick beans when young and tender. You should be able to snap them in half. If you allow them to grow too big, they are best kept for seed saving instead. To prepare your beans, wash gently. Then trim the end stalk off and remove string if necessary. Beans are best lightly steamed or cooked in soups, casseroles and savoury dishes. 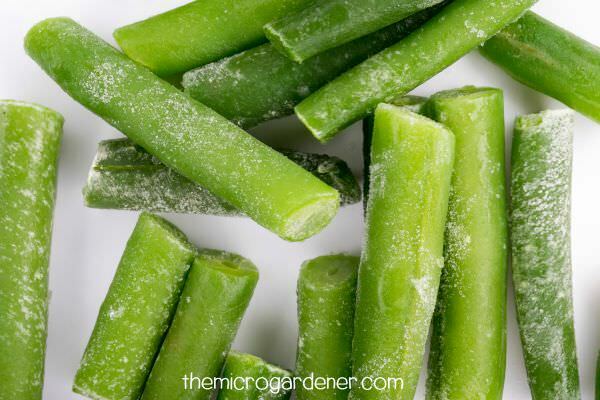 To prepare for freezing, plunge cut beans into boiling water for 2 minutes, then immediately into chilled water. When cool, pack into an airtight container for freezing. Want to learn more about growing beans? Read 3 Tips on Growing Peas and Beans and how to grow a Jack and the Bean Stalk Theme Garden. These vegetables may contain a LOT of soil inside the leaves, especially if you have hilled them up while growing. Carefully wash both the outer leaves and down the stem to remove any soil in between the leaf layers. Slice the stem thickly. Cook in boiling water for 3 minutes, then plunge immediately into chilled water. You can thaw and re-cook after freezing or add straight into casseroles or meals immediately. Don’t waste the leafy green tops. Wash and chop these too. They can be added to soups, stews, casseroles, soup stock with other vegetables or sliced thinly and cooked in oil as a crispy garnish. No food waste! Do you need a little help with pest management? Do mosquitoes, flies and caterpillars really bug you? 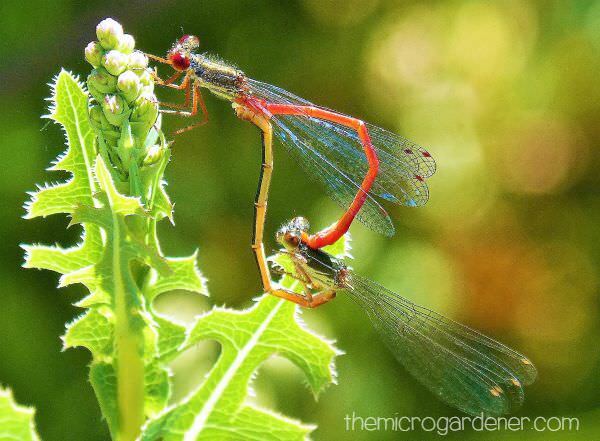 Let me introduce you to one of the most beneficial insects you can attract to your garden. Damselflies are dragonfly ‘cousins’. These winged wonders are one of the best predatory insects you can have working to remove mosquitoes and other pesky insects from around your home and garden. These delicate looking beauties have huge eyes and amazing eyesight, are incredible hunters and romantic lovers. Who knew insects could be so … interesting? It’s a bug eat bug world out there and if you know who’s who, you can get a little help from nature. So exactly how DO damselflies manage the mosquito population? Young damselflies live in water and one of their favourite foods as they grow, are mosquito larvae (those little wrigglers). When damselflies grow into adults, they dine out on flies, mosquitoes, moths and some species even feast on beetles and caterpillars. Pretty handy helpers hey? The lovely adult ladies (and gents) rest silently while holding their wings together. Then they wait for prey (including mosquitoes) to come close enough, before launching themselves into action. They use their hairy back legs to grab the prey as they fly and catch it unawares. Once caught, they eat until dinner is all gone. The pests have no chance! 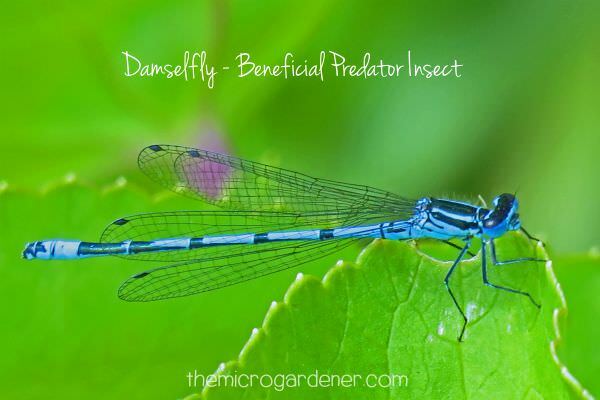 Damselflies are ferocious predator insects that you need working for you in your garden. Their dazzling colours are stunning. Not only that, but these gorgeous creatures take romance to a whole new level. When mating, they form a heart shape between their bodies. Aww! Love in the garden. How beautiful is that? If you want to attract these ‘mosquito munching machines’ into your garden, add a water feature and avoid using any chemicals. A small pond or large pot with a few aquatic plants like water lilies, are a perfect magnet for damselflies. Give and you shall receive free gifts from nature! 7 Facts about Society Garlic – Did you know? 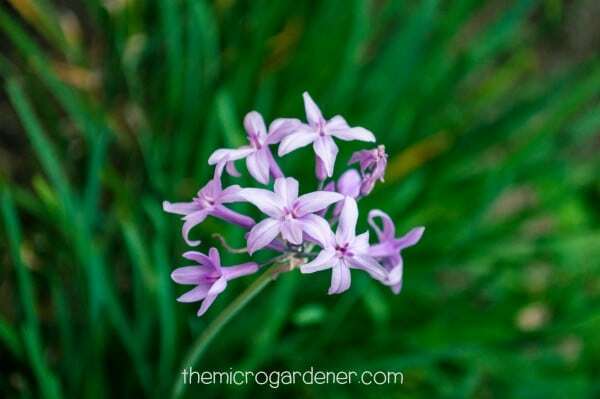 Tulbaghia violacea, a delicious member of the Allium (onion) plant family with antibacterial, antifungal and antioxidant properties. Named ‘Society Garlic’ because it’s supposed to provide you with the taste of garlic without the bad breath! Not actually a garlic at all. Its aromatic and tasty leaves have a very similar flavour, so makes a great substitute for garlic, chives and spring onions. Easy to grow in full sun or partial shade in pots or garden beds. Valued for its pretty edible mauve-coloured blooms, free seeds after flowering and lasting well as a cut flower. Hardy through drought, low maintenance and needs little watering once established. Grown as an ornamental edging and can be divided in spring for more free plants and stronger clumps. Live on the Sunshine Coast or SE QLD and want to join me at one of my upcoming workshops? Visit my online Events Calendar for the latest updates. If you’d like to receive an invite, please email me with ‘ADD TO WORKSHOP INVITE LIST’ in the subject line. You’ll get an email reminder for future events so you hear about them as soon as possible. If you missed the tips in my last newsletter, CLICK HERE. For a selection of past newsletters, CLICK HERE.